Archbishop Joseph W. Tobin, a Redemptorist and the ordinary of the Archdiocese of Indianapolis, has been named a cardinal by Pope Francis. This is the first time the see of Indianapolis has been represented in the College of Cardinals. Of the 17 men the pope chose from 11 countries, three are from the United States. The other U.S. archbishops chosen are Blase Cupich of Chicago and Kevin Farrell, most recently of Dallas but appointed to a Vatican post in August. The pope will elevate the newly appointed men at a consistory held at the Vatican November 19, the vigil of the conclusion of the jubilee year of mercy. After hearing the news, Archbishop Tobin tweeted, “I am shocked beyond words by the decision of the Holy Father. Please pray for me." Born in Detroit in 1952, he made his profession as a Redemptorist on August 5, 1973. 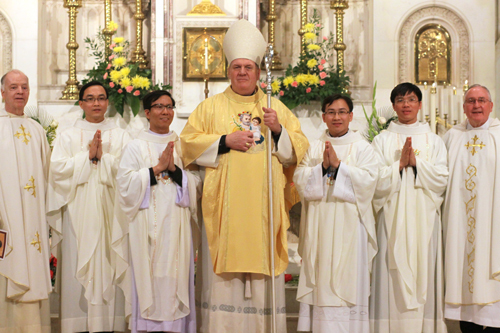 He was ordained a priest on June 1, 1978, and ordained a bishop on October 9, 2010. In October 2012 he was appointed archbishop of Indianapolis. Archbishop Tobin was superior general of the Redemptorists from September 1997 through November 4, 2009. In August 2010 he was appointed secretary of the Congregation for Institutes of Consecrated Life and Societies of Apostolic Life and held that post for two years.